On Calif. Cattle Ranch, Students Wrangle With Meaning Of Manhood Deep Springs College is an all-male school — and a working ranch. It sounds very macho, but the increasingly diverse student body says being a man is all about questioning the meaning of masculinity. Nick Marino feeds and waters the livestock at Deep Springs College, an exclusive, all-male institution in a remote valley in California. For All Things Considered's "Men in America" series, NPR's Kelly McEvers sent this report on Deep Springs College — the all-male college that her husband attended, and where he and McEvers have both taught. About a hundred years ago, a man named L.L. Nunn was building power plants in the American West. He wanted a place where workers could be educated — and educated people could do work. He bought a ranch in the high California desert, in a remote valley east of the Sierra Nevada, and called it Deep Springs College. Nunn said he chose that place because the desert has a voice. Gentlemen, for what came ye into the wilderness? ... You came to prepare for a life of service, with the understanding that superior ability and generous purpose would be expected of you. In what is now one of Deep Springs' founding texts, Nunn wrote that if you listen, the voice will talk to you. And this is what it will say: "Gentlemen, for what came ye into the wilderness?" Not just for academic training, Nunn wrote, not just for ranch life and not to learn a trade or profession. You came, he said, to prepare for a life of service. His idea was that labor, education and self-governance should exist in the same place — and that that place should groom the country's next leaders. A century later, what does it mean to be a man at such a place? Deep Springs is more than a school; it's also a ranch and a farm, where students help harvest alfalfa and herd cattle. And the two-year institution is one of the last remaining all-male colleges in the country that's not religious or military. On a hot, dry day, David Welle, who attended Deep Springs in the 1980s, gives a tour of the college. When you first arrive at Deep Springs as a new student, he says, there are all these stories in the air, about the grizzled cowboys who worked at nearby ranches and the prowess of students who came before you. "Guys who would build the most immense gates that would be indestructible to 2,000-pound cows," Welle says, "or guys that would load 5 tons of hay by themself, in one day." They were guys who'd done well in high school, and then spent their time at Deep Springs living up to the manly ideal of working hard and being strong. 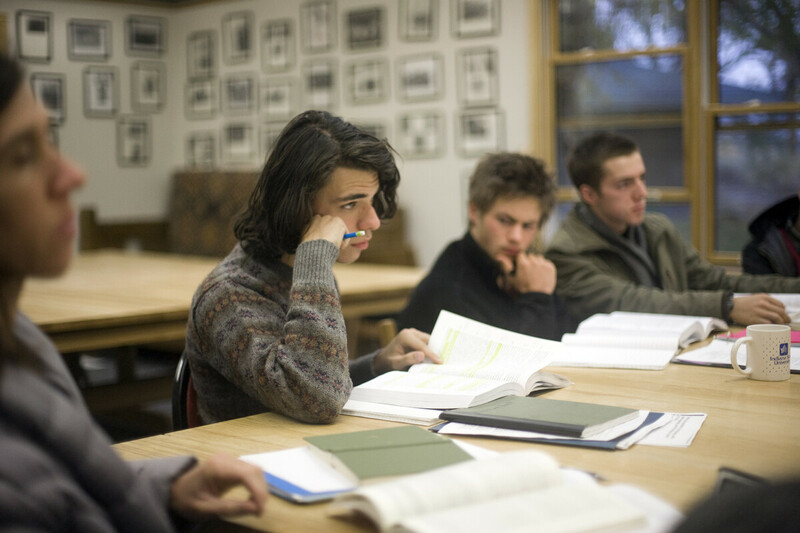 Deep Springs is a working ranch, but it's also a liberal arts school. Many students go on to top-tier schools when they leave the two-year college. For a long time, this is how it was for students who came to Deep Springs. More and more, though, Deep Springers are calling that manly ideal into question. The only real town near Deep Springs is Bishop, Calif., where some students recently went for a festival called Mule Days. They're getting ready for a steer-decorating contest. Teams have to wrangle young male cattle and tie a bow on each one's tail. Nick Jones, who grew up in suburban Colorado, says he was worried Deep Springs would be like other places where teenage boys get together: competitive and macho. But it's not what he'd feared. "I have a suspicion that Deep Springs is the least macho right now that it's ever been," Jones says. That's because, in addition to being a ranch and a farm, Deep Springs is also a rigorous liberal arts college — a place where archetypes like cowboys have been called into question for a long time. "I think people are generally pretty self-critical, so they don't hang onto a lot of anxiety around proving their masculinity," Jones says. So now, when Deep Springers do things like get on a horse to ride to a steer-decorating contest, they do it with a wink — acknowledging the manly pose and mocking it, too. At the contest, the Deep Springers get their steer — but the announcer calls out that an all-female group from Oregon State beat them. Back in the Deep Springs Valley, in a field full of hundreds of cows, Zach Robinson, a mixed-race cowboy and aspiring math and computational science major, is filling a trough with water. "For most of Deep Springs' history, the reality of the situation has been that our cowboys have been straight white males," Robinson says. I get to play with the mythos a little — I get to exist in this world while at the same time not really being a part of it. "I think that makes it more exciting for me in some ways, because it's like, you know, I get to play with the mythos a little — I get to exist in this world while at the same time not really being a part of it," Robinson says. "And I'm not really sure I will want to wholly embrace, like, a totally macho aesthetic." Bach Tong, a gay poet originally from Vietnam, is cutting onions for a barbecue at the college. He says he pushes other students when he thinks they're trying to be too macho — like when they act like it's cool to be muddy and unwashed, something he says an immigrant like him would never think. "It's interesting. It's become something very exotic and something to celebrate," Tong says, "you know, how many days someone hasn't showered." So if you ask Deep Springers what it means to be a man, the answer is: to question what it means to be a man. That questioning is one thing Philippe Chlenski says he'll take from Deep Springs when he goes back into the world, to his hometown, Chicago. He says this while milking a cow. "I feel like I have a new position from which I can now engage with masculinity outside, having seen things I associated so closely with masculinity kind of fracture from it in some ways." All this fracturing and questioning could result in big changes at Deep Springs. The students, faculty and board of trustees recently voted to go coed: The college had even started taking female applicants. But a few alumni are fighting that decision. It's now up to the California courts to decide whether this place is just for, as Nunn's desert voice puts it, "gentlemen" — or if it's for everybody.